Knowing how to fillet a fish is essential if you like harvesting your catches. Some say this is the worst part of the whole fishing experience, but the chore becomes tolerable when you think about those tasty fillets you get to eat later. The task of cleaning fish is simple if you have the right equipment. I suggest starting with a good cleaning table set at the right height to minimize back strain from bending over too much. A cleaning board is a must. I recommend either a store-bought model or a flat scrap piece of lumber (avoid using treated wood though to prevent any chemicals from soaking into your fillets). A sharp fillet knife is essential to cleaning your catch and I always use an electric knife whenever electricity is available. I have been using an American Angler model for years and it has been very dependable. My model came with two blade sizes: an 8-inch model for crappie and walleye and a 5 1/2-inch version for bluegill. I have found that the 5 1/2-inch blade works best for me cleaning crappie because it gives me a more precise cut than the 8-inch version which also tended to tear the meat after I had cleaned about five or six fish. They say that a sharp knife is safer than a dull knife. While I’m not sure about that, I do know that a sharp knife is key when filleting fish. Having a thin and easy to manage, sharp blade will help make this entire task much less cumbersome. A bowl for holding the fillets while you are cleaning a mess of fish is also a must. I prefer using a glass bowl from an old mixer my wife discarded because it’s easier to clean and remove any blood stains from the bowl. Once you have the right equipment, follow these five easy steps to clean your catch. Lay the fish on the cutting board or some type of flat, hard surface. Grasp the fish by its mouth and place the knife’s blade behind the fish’s gills and cut inward and downward towards the head until the blade reaches the backbone. Be careful not to cut into the backbone. Turn the knife 90 degrees towards the tail and glide the blade along the backbone. Make sure your blade stays on top of the back and belly fins and cut through the fish’s rib cage. 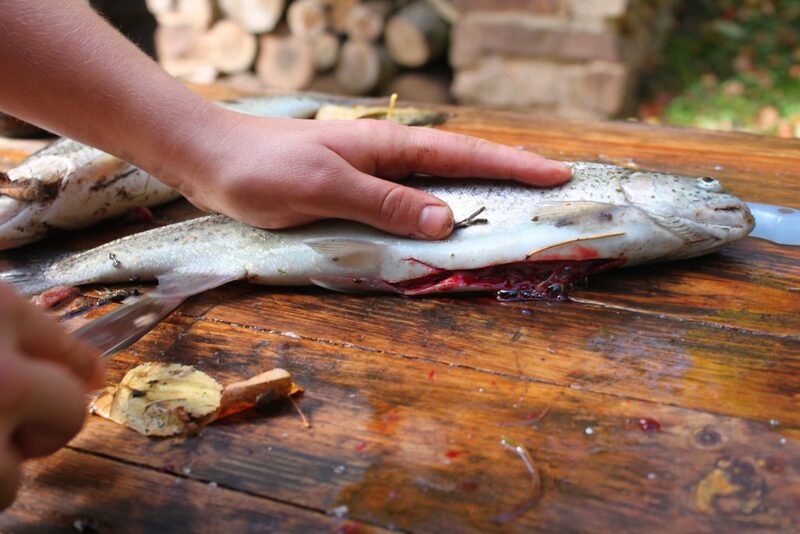 Try to avoid cutting into the backbone so it’s better to cut too shallow into the fish rather than too deep. Continue to cut through the body towards the tail and then exit the blade at the base of the tail. With the fillet still attached to the tail, flip it away from the fish and position the knife on the thin portion of the fillet. Hold the fish and slice between the meat and skin to remove the fillet. Run the blade at a shallow angle to avoid slicing through the skin and making sure to cut as close to the skin as you can to get the most meat for the fillet. Move the fish away from the fillet to work on removing the ribs from the fillet. Position the tip of your knife at the top of the rib cage and cut downward along the rib cage all the way to the bottom of the fillet. Angling your knife and slicing close to the ribs guarantees you will retain the most meat on your fillet. Then carefully remove the rib cage from the fillet. Set the fillet aside in some type of a bowl, turn over the fish and repeat steps 1 through 4. Turn the knife 90 degrees towards the tail and glide the blade along the backbone. Make sure your blade stays on top of the back and belly fins and cut through the fish’s rib cage. Try to avoid cutting into the backbone so it’s better to cut too shallow into the fish rather than too deep. Continue to cut through the body towards the tail and then exit the blade at the base of the tail.Lay the fish on the cutting board or some type of flat, hard surface. Grasp the fish by its mouth and place the knife’s blade behind the fish’s gills and cut inward and downward towards the head until the blade reaches the backbone. Be careful not to cut into the backbone. After cleaning all the fish, I rinse off the fillets with tap or lake water and rub off any blood or scales sticking to the fillets. If I feel any small bones in the fillets, I trim those out with a conventional fillet knife. Some of the fillets go straight to the frying pan while others are stored in the freezer. I place a certain amount in a Ziploc freezer bag and mark on the bag the number of fillets and the date of the catch for future reference. How you handle your outboard in the winter depends to a large extent on how you use it. If you occasionally fish when it’s warm, that’s one thing. If you let it sit for three or four months, that’s another. Industry experts say that for the occasional user the two big things are proper warmups and keeping water out of the lower unit. Experts define proper warmup as letting your motor run at idle for a few minutes before you blast off towards your favorite fishing hole. You want the thermostat to open and water to run through the system so that the motor is being cooled properly. You’ll know this is happening if water is running out of the telltale port (pee hole). What happens when you blast off too quick is that the motor gets hot and then when the thermostat opens the cooling system pushes cold water against hot metal. Do not run the motor if the telltale port isn’t peeing water after a minute or two. That’s an indication that something is wrong. Have it checked out by someone who knows what they’re doing. Keeping water out of the lower unit is easy enough if you trim the motor down and let it drain before you leave the ramp, and if you always store the motor trimmed vertical. Getting all the water out is simple if you just look around for a pothole in the gravel, asphalt or concrete and position the motor over it before you hit the trim button. That’ll open up enough room to get the motor all the way down. Do not, under any circumstances, run your motor dry to get the water out of it. It only takes a few seconds to overheat one, and once that happens you’ll need to check your bank balance and head towards the local dealership with your hat in your hand. Another common problem with running outboards dry is that the impeller gets damaged by the heat. It doesn’t always show up right away, but it will show up sometime in the future. If you store your boat outside, some experts recommend wrapping the lower unit with plastic as an extra protection against the weather. If you do this, make sure it’s tight. Otherwise you could actually trap water around the lower unit and make matters worse. The situation is more complicated if your boat is going to sit all winter. There are all types and designs, makes and models of outboards. Each one is different, and the new outboards are very different from the older ones. Some require fogging and removal of the plugs. Others require nothing more than what was described above for occasional use. The thing here is to get accurate information about your exact motor. A good place to start is the internet, but make sure you know what site you are on and who’s providing the information. Manufacturer sites are reliable and will give you good information. Be wary of discussion boards and private sites, however. Some of the stuff that’s posted on them is good, but much of it is nothing short of crazy. Unfortunately, a lot of the time it’s hard to tell the difference. You’ll also want to check with a local dealer who has a good reputation and who services your make of motor. They’ll be able to give you good information and will have whatever parts or products you need to properly winterize your motor. Of course, you’ll need to drain all the water out of your lower unit, make sure it’s full of grease — never store one empty — and store it in the vertical position. If you take care of your outboard, it’ll give you hundreds and hundreds of hours of reliable service. If you don’t, it’ll frustrate you and make your fishing a chore instead of a pleasure. If you’re feeling down or burnt out, it might be time to get back into nature. According to Niels Eék, psychologist and co-founder of mental wellbeing and self-development platform Remente, spending time in nature may be the key to good mental health. “Several researchers have looked into the health benefits connected to spending time out in nature. One study specifically, which was recently published in BioScience Journal, found that daily exposure to nature can, among other things, help reduce feelings of stress and even improve your self-esteem, for up to seven hours. Reconnecting with nature can also help you become more mindful and present in the moment,” Eék said in a statement. A study from the University of Michigan suggests that being in nature not only improves your mood for the time, but also has positive long-term effects when it comes to depression and memory. An Australian survey funded by the Recreational Fishing Initiatives Scheme reports relaxation and stress relief are the main benefits people get from recreational fishing, according to reps for Fishbrain, a mobile app and social network for people who love to fish. The free app has attracted millions of users who have discovered fishing as their newfound self-care hobby. 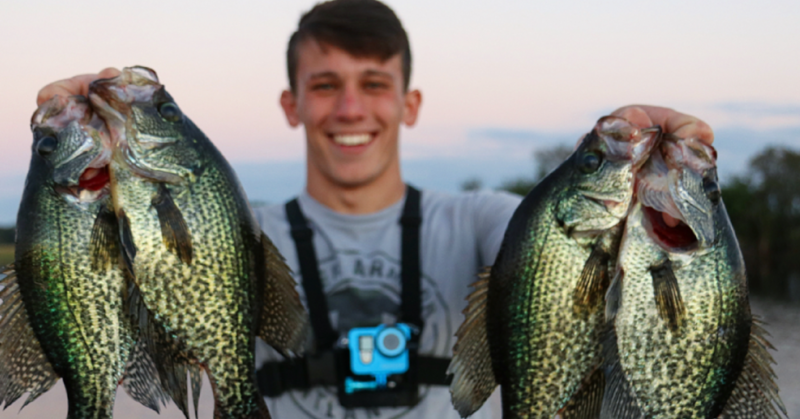 The app uses an interactive map to allow users to find the best places to fish, as well as record their catches, plan trips, share tips and techniques, and purchase the latest gear. So it’s easier than ever to go fishing, even if you’re a newbie, without the added stress of not catching anything. Fishbrain’s users can attest to the mental health benefits of fishing. “Fishing has become critical to my mental health. My job as a sales/production manager can be quite stressful at times, and nothing relieves stress and centers me like fishing,” said Gabe Beaudry of Central Oregon. We made it!!! Another year has come and gone. Holiday decorations are coming down and we’re all looking ahead to new beginnings. It’s time for a new start, but just like you’re planning goals to slim down your waist line, go to the gym or save more money, you can also make some resolutions to improve your fishing game this year. Here are some goals that will help you catch more fish in 2019! 1. Improve Your Casting – Nothing will improve your catch-rate faster than learning to put your bait in places other people can’t get to. Practice in the backyard by setting up some buckets or targets. Work on different styles like flipping, pitching, back hand and underhand casting. 2. Create a Fishing Journal – Logging information about your experience on the water can make a huge difference in helping you prepare for your next trip or even years later. Things like water temp, weather conditions, water clarity, baits used, fish caught and any other details are vital. 3. Learn a New Technique – Great anglers don’t get there without a lot of time and energy spent learning new techniques. Need to learn to flip shallow cover better? 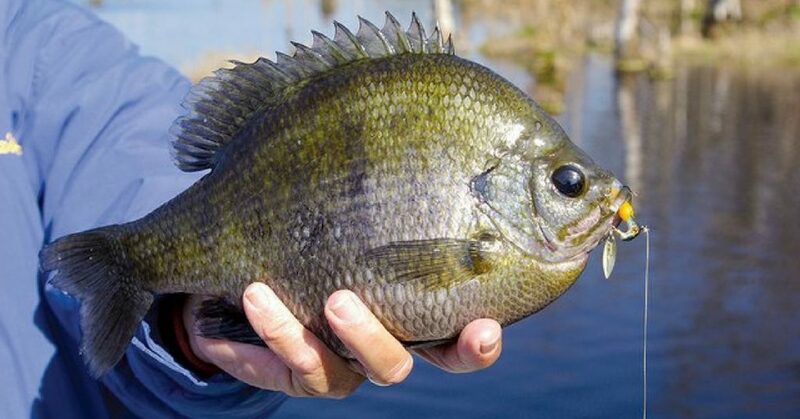 Big swimbaits? Deep water? Whatever is lacking in your game, work hard this year to improve it. 4. Organize Your Tackle – Every minute that you’re digging around your tackle boxes is time that your line could be in the water. Spend a day or two and really organize your baits. Take out stuff you don’t use, replace treble hooks, separate plastics into style or whatever works best for you. 5. Oil Up Your Reels – Cleaning and adding lube to your reels is vital to get the most out of every cast. A well-oiled reel can be the difference between a 40 yard cast and a 60 yard cast. The smoother your reel, the more precision your casts will be as well. It’s all about performance. 6. Try New Baits – Whether it’s an awesome service like Lucky Tackle Box that provides new products on a consistent, monthly basis or browsing your local tackle shop, trying new products is essential. Believe it or not, fish get conditioned to the same baits. Change it up! 7. Sharpen Your Hooks – This is something that is so often overlooked. Nothing can mess up your day like dull hooks. It is so easy to get a small sharpening stone and run it up your hook point a few times to get that deadly sharp edge. It’s easy and will catch you more fish. 8. Replace Fishing Line – Line has an expiration date. After exposure to the elements and frequent use, line becomes weak. Using backing line like braid will help your spools last longer (and be cheaper). If you fish a lot, it is a good habit to replace all of your line on an annual basis. 9. Do Prefish Homework – There is so much you can learn about fish behavior and your local lakes when you’re off the water. Study Google maps, online forums or watch YouTube (or LTB’s how-to video collection) and many others. If you’re stuck inside in winter, you can still be improving. 10. Workout Your Mind/Body – Being mentally and physically ready is just as important in fishing as it is in other sports. Things like visualization, focus, endurance and strength can play a big part in your on-the-water performance. If you don’t want to get fit for health, better fishing is a good motivation. We hope these are some resolutions that you can keep in 2019. When you’re holding that big limit of giant bass or spreading that new personal best all over the internet, you’ll be happy you did!